2010, Universal Pictures. Directed by Edgar Wright from the graphic novel series by Bryan Lee O'Malley. Running time: 112 minutes. PG13. Starring: Michael Cera, Mary Elizabeth Winstead, Ellen Wong and Kieran Culkin. Mathew: OH MY GOD! It was like this film was made for me specifically. I loved this film and everything about it. It is the most awesome piece of filmic perfection ever commited to film. It will change the way films are made in the future. Helm: T'is not for everyone, jackanapes. Mathew: WHAT?! What are you talking about? This film is totally perfect. Are you saying you didn't like it? Helm: I also greatly enjoyed it. I'm just saying that it is possible it would not appeal to everyone with the same ferocity with which it appealed to you. Helm: Do not "dude" me. I am correct and you are, once again, carried away by your foolish emotions. Helm: Enough! Yes, the film was exhilirating and funny...the fighting...the rocking...but t'is easy for me to imagine that many people would find it silly and frivilous. Mathew: Silly and frivilous? This film has more depth, more... soul, in its little pinky than most mainstream hollywood movies have in their whole big-budget-bodies. Mathew: NO! It's not fine! 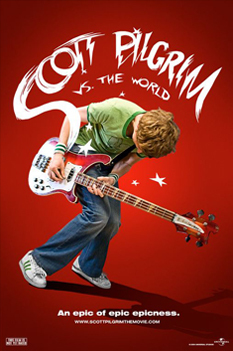 Scott Pilgrim vs. the World was incredible and I want you to admit that right now. Helm: You are irrational. There is no point discussing this further with you. Mathew: ADMIT IT! ADMIT IT!